The Natchez Blog: I'm Back! I have returned from my DC protests without getting arrested. It was a wonderful experience. Some of the news reports said 100,000, because that's what was expected. However, it was successful far beyond the organizers' hopes - there were half a million people there! In fact, the start of the march was delayed for an hour, because the National Park Police had to change our route as we had too many people for the original route. It was wonderful meeting people from all across the country. They really represented a cross section of America - from babies to geezers, rich and poor, every imaginable ethnic group, all of the states. The mood of the group was very positive and upbeat, but it was very sad to see the families with pictures of their loved ones who had been killed in the war. And it was a long route! We walked from the national mall all the way around the Capitol building and back. For those of you not familiar with DC, that is lots of walking. Plus, we were standing for quite a while as we lined up. By the time it was over, I was unbelievably exhausted. I keep forgetting I'm not as young as the last time I did this. Next time, I'm bringing a wheelchair! 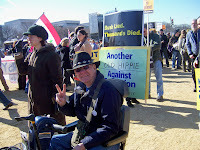 Then I'll be like this guy - "Another Old Hippie against the War". The Mayor and Aldermen meet tomorrow night, so I'll be back to Natchez politics. Hope you gave'em hell Casey! Wish I could've gone--it was for a very important cause and I'm glad so many were there to represent all of us who could not be, but who believe escalation in the war, is not the right thing for our country and our soldiers. Welcome Back. 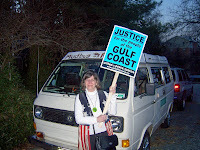 Love the VW hippie van(background) and your partriotic vest.